1) Download the XpertMartInstall.dmg from http://XpertMart.com/demo/download/demomaclicense.html . After accepting the license agreement choose the Snow Leopard version of the download by clicking on the purple Snow Leopard icon with the X on it. This file is a DMG disk image that contains the XpertMart ™ installation software. Wait until the download is complete. If your web browser and system are properly configured, will mount it as a virtual disk and open a new Finder showing its contents. If so, skip to step 2. If the virtual DMG disk doesn't automatically open when your download completes, find the XpertMart_SnowLeopardDemo.dmg file you just downloaded. It will usually be saved to your desktop. Double-click this DMG file to open it as a virtual disk in a new Finder showing its contents. From the first step a Finder window will appear containing a folder icon named main. Simply drag this folder icon to your Macintosh HD to install. Do not install the main folder into the Applications folder or XpertMart ™ will not work properly. The Finder window also contains a file named Firebird-xxxx.pkg. Double click this file to install the Firebird DBMS. Simply follow the instructions on screen. 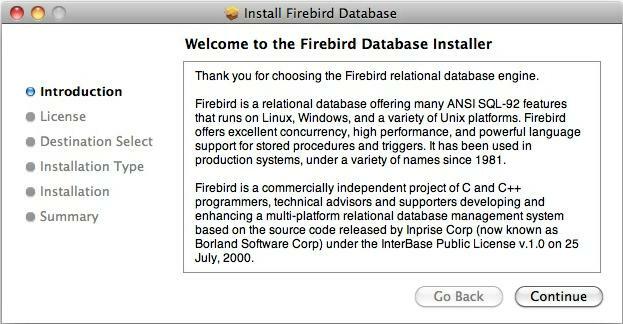 Warning: make sure you only install the Firebird DBMS once. Even if at a later time you download a new version of XpertMart ™ you should not reinstall the Firebird DBMS if it is installed already. XpertMart ™ uses a HASP key is used to restrict unauthorized access. While you do not need a HASP key to run the demo version of XpertMart ™ you do need to install the Sentinal HASP RTE software before you can begin using the system. If you are installing the complete version run this process before you plug the HASP key into the USB port of your computer. Click on the Sentinal_HASP_RTE_Installer.dmg which will open the virtual disk as shown below. 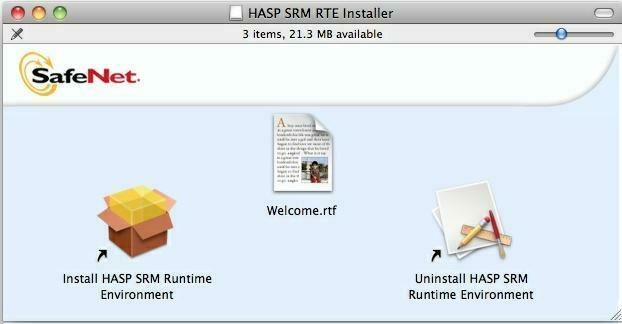 By double-clicking on the "Install HASP SRM Runtime Environment" icon a window will open up so you can install the HASP software. Click on <Continue> and follow the instructions. Your Sentinaaal HASP software is now activated. You do not need to restart the computer. You can now plug the HASP key into the USB port and enter XpertMart ™ by double-clicking on the "XpertMart.jar" file in the /Main directory, or by using the desktop shortcut you created. Once XpertMart™ is installed, you can safely "Eject" the XpertMart_SnowLeopardDemo virtual disk and the Sentinal.dmg virtual disk, they'll be cluttering up your desktop and you don't need them any more. You can drag them to the Trash icon. 5) In the main folder there should be a file named XpertMartAliasWithLogo.zip and also a copy of this file as shown below. Drag the XpertMartAlisaWithLogo copy.zip file out of the main folder and onto the desktop, as show above. Once you have the file on the desktop double click on it and it will unzip the XpertMart alias with an XM XpertMart logo as shown here below. Once this is done you can drag the ZIP file to the trash and have only the XM XpertMart alias left on the desktop. Your Mac has to be restarted before you use XpertMart ™ for the first time. To begin using XpertMart™ the only thing you need to do is to double-click the XM XpertMart alias left on the desktop. If for any reason your installation of Firebird on OS X is not installed correctly or working properly then you need to uninstall the current Firebird in order to successfully do a new install. Reinstalling Firebird on top of a working Firebird will cause it to stop functioning! You can then proceed to reinstall Firebird.